An adaptation of the best-selling novel by Emma McLaughlin and Nicola Kraus, The Nanny Diaries finds a decent balance between social commentary and humour as a college graduate from New Jersey dives into the upper crust world of New York's wealthiest families. Annie Braddock (Scarlett Johansson) is at a crossroads in life, recently graduated from college, and resisting a push by her mother Judy (Donna Murphy) to pursue a career in finance. Annie stumbles into a summer job as a nanny for a woman to be known only as Mrs. X (Laura Linney), her husband Mr. X (Paul Giamatti) and their young son Grayer (Nicholas Art). The rich X's live among New York's elite on Manhattan's Upper East side. Treating her experience as an anthropological expedition into a world she knows nothing about, Annie finds plenty of turmoil in the X household, just beneath the stiff social facade of affluence and happiness. Mr. X is a workaholic executive ignoring his family and barely concealing an affair, Mrs. X is miserable and emotionally stilted, and Grayer receives no meaningful attention from his parents. After a rough start Annie forms a deep bond with Grayer and meets the hunky neighbour to be known only as Harvard Hottie (Chris Evans). But with the marriage of the Xs disintegrating, Annie finds herself caught in the crossfire, with Grayer as the most vulnerable potential victim. Co-directed by Shari Springer Berman and Robert Pulcini, The Nanny Diaries compacts the book into a useful film experience, and achieves the dual objective of delivering some laughs while probing the meaning of parenting and the blind pitfalls of a money-soaked lifestyle that promises everything except actual fulfillment. 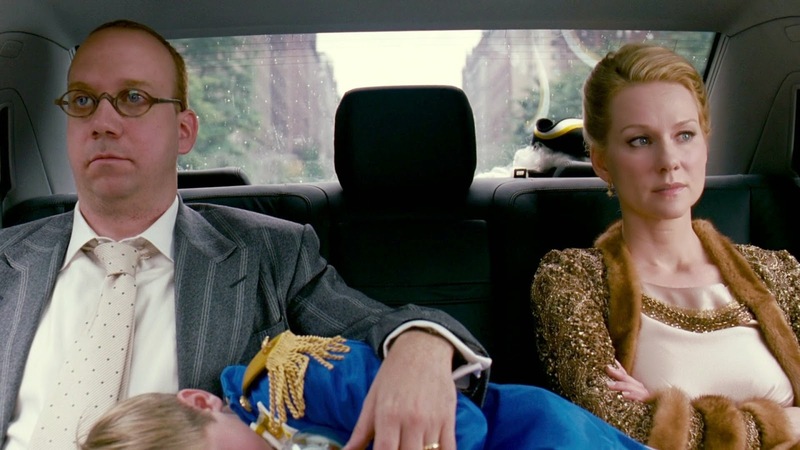 But the film does not pull back from a uniformly unflattering portrayal of New York's nobility. While the script (also by Berman and Pulcini) enjoys taking broad shots at mommies who don't know that first thing about parenting and absentee narcissistic fathers, the broad stereotyping deprives the film of some much-needed depth. Otherwise, approaching Annie's experience as an anthropology lesson is a clever narrative device, enhanced by museum-style natural history displays drawn from various cultures. There are also references to Mary Poppins sprinkled into the movie, mostly in the form of an umbrella that fortuitously makes appearances at key moments in Annie's summer of nanny adventuredom. Scarlett Johansson gives Annie the necessary resolve mixed with the timidness of a young but smart woman thrown into a foreign culture. Johannson conveys the quiet disbelief at the absurdity of Mrs. X's world, without descending into snarky sarcasm. Laura Linney is confined to the role of the wife forced to conform to the expectations of an unsympathetic peer group, Linney easily able to capture the coldness of Mrs. X's lonely world, without diving below the surface iciness. Singer Alicia Keys gets a spirited supporting role as Annie's best friend. The Nanny Diaries is an undemanding film, not exactly fluffy but never threatening to be more than a superficial treatment of a potentially provocative topic.